Contents: 32 animal cards (4x 8 animals), 1 waterhole card, 1 crocodile, 1 set of instructions. Short game instructions: • Place the crocodile on the pond card in the center of the table. Shuffle all the animal cards and deal them equally to all the players. Lay down the cards in front of the players as a face-down deck. • Play in a clockwise direction. Players turn over their own top card and place it face-up between their own deck and the edge of the pond. • Is there one type of animal more than once in the center of the table? No: Say “snip” and continue to play. Yes: Say “snap” and try to be the first one to hit the crocodile. Whoever manages to do this takes all the face-up previously played animal cards and lays them face-down under their own deck. • Turn over new cards from your own deck, lay them down, and again say “snip”. 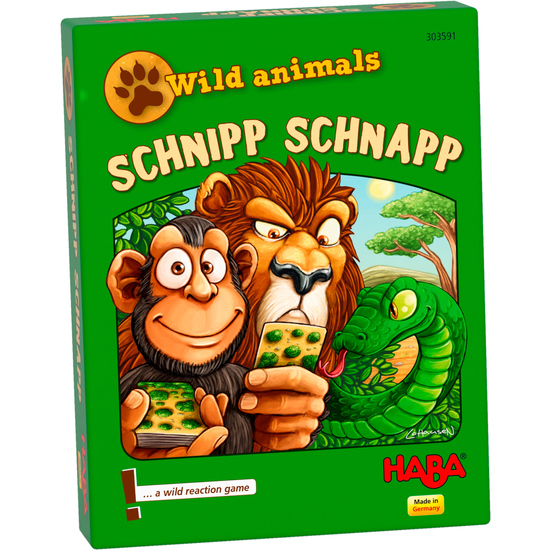 • The player who has collected all the animal cards in their deck wins.